“Canada is a constitutional monarchy and the Lieutenant Governor is The Queen’s representative in Ontario. The Queen is head of state while the Premier is the provincial head of government. In our system of parliamentary democracy, these two roles are distinct: the head of state (commonly called the Crown) holds supreme power on behalf of the people and lends it to be exercised by the government of the day. “In Ontario, the Lieutenant Governor exercises the powers of the Crown, which derive from the written constitution, constitutional convention (non-legal rules of the constitution), and statute law. These powers are similar to those of the Governor General with regard to Parliament and the federal government. 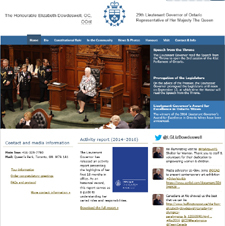 The Honourable Elizabeth Dowdeswell, OC, OOnt, Lieutenant Governor of Ontario, Constitutional Role, at http://www.lgontario.ca/en/crown/Pages/introduction.aspx, accessed 24 August 2016. Page created by: Ian Clark, last modified on 20 Septeber 2016. Image: The Honourable Elizabeth Dowdeswell, OC, OOnt, Lieutenant Governor of Ontario, Constitutional Role, at http://www.lgontario.ca/en/pages/default.aspx, accessed 20 September 2016.